You are currently browsing the tag archive for the ‘Ben Mantle’ tag. What It’s Like to be a Picture Book Debutante with Penny Parker Klostermann, an OLD DRAGON, plus a giveaway! 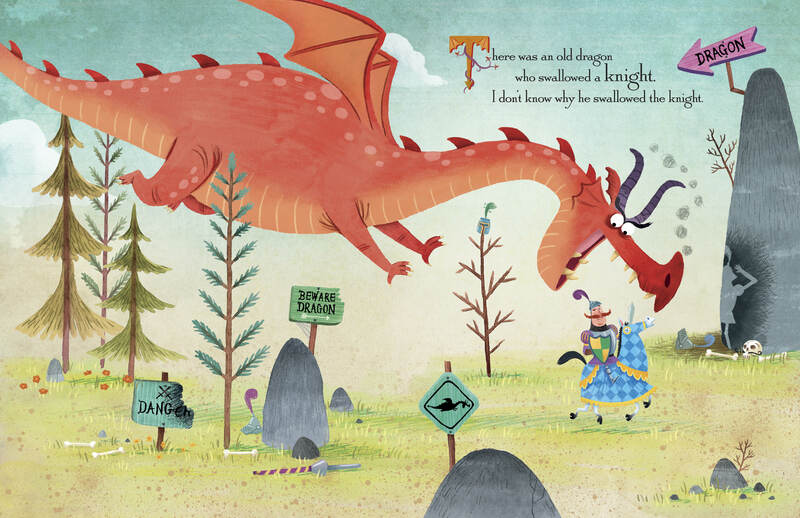 Three [hundred] cheers for Penny Parker Klostermann, whose debut picture book THERE WAS AN OLD DRAGON WHO SWALLOWED A KNIGHT debuts TODAY from Random House! I’m chatting with Penny about being a debutante—besides the glittery tiara and the boutonnière, what it’s like and what she would recommend to others twirling through the same shindig. It’s a tremendous learning experience. Umm, let me rephrase that…it’s the JUST THE BEGINNING of a tremendously exciting learning experience. Penny, what was your breakthrough moment? I’m not necessarily talking about when you got your agent or your debut deal, but when you realized that you had crossed over from TRYING to do this book thing to KNOWING that you were going to get published? I honestly didn’t KNOW until I was offered a deal. I felt I had a good chance of getting published because of winning runner-up for the SCBWI Barbara Karlin Grant and getting an agent, but I was immersed enough in the kidlit community that I knew how difficult it was to get published. I knew that my manuscript had to land on the right desk at the right moment. Now one thing I did KNOW is that I was taking getting published very seriously. I listened when people said to read tons of picture books. I listened when they said to learn from critiques and not get defensive. I read blog posts, books, etc. on writing picture books. So what I’m saying is I worked hard and behaved like an author. What makes you a) most excited about your debut book AND b) most anxious? I’m most excited about having this dream come true. I can’t wait to see my book in stores and on library shelves. I believe my book will make kids laugh and I’m very excited about that! I’m most anxious about criticism. I’d like to say, “Well, I love my book so I’ll be able to take all criticism in stride and move on without it effecting me in the least.” But the truth is that I know I’ll be sensitive to negative comments and will have to learn to take them in stride and move on…but it will affect me. I noticed that the Random House Picture Books fall 2015 brochure has DRAGON on the cover. That’s got to feel awesome to have a lead title as your debut! I was thrilled. I just hope it helps with sales. I’ve also seen these cute illustrated jokes floating around on social media! What a clever campaign! Are you doing anything special to celebrate the launch? Either personal or promotional? I’m having a signing on release day at a local bookstore/gift store. He promotes books. Has a column in the newspaper. He connected me with the TV station and I’ve done one interview and have a 2nd tomorrow. Then another newspaper editor did a color spread this past Friday. That same bookstore owner signed me up to be a feature author for the fall book festival, too. I’ll do 10 school visits and 4 talks. I’m doing a signing in Denver in October. In November my publicist set up 2 school visits in conjunction with a bookstore in Houston. That’s all for now. I’d like to more events but it takes a lot of money and time away from writing. I hear ya! I’ve done plenty of events that netted me nothing financially, and that’s time I could have spent creating my next book. It’s very difficult to know which events will be worthwhile endeavors, but in general, it tends to be the ones for which you are paid. What has surprised you most about the debut experience…and what do you recommend to other authors awaiting their debut release? What surprised me the most was that there wasn’t a national fireworks display planned in my book’s honor! I mean I felt like there should be plans for fireworks…these are exciting times! Seriously, I have fireworks going off in my head because my book is going to be out in the world, but in the waiting life goes along like it always has: writing, reading, critiquing, learning. Here are your fireworks, Penny! But along with that are a lot of things you can do to prepare for the launch. I read a lot of blog posts about launches, launch parties, book signings, blog tours, etc. I digested what others were saying and then started making plans. It was surprising to me how much time I spent on these extra “writing” tasks .They’re not really writing but they needed attention which took me away from my real writing more than I liked. As far as advice to authors awaiting their debut deal? Just be aware that you will have these extra tasks. When you come across information about releases, bookmark it. I just wrote a blog post for Julie Hedlund’s 12 x 12 about preparing for my launch. In that post I reference Lisa Schroeder’s helpful “Timeline and Checklist” post. Your illustrator Ben Mantle has two books releasing today–yours and Beth Ferry’s LAND SHARK. How do you think he’s feeling today? Have you chatted with him about this auspicious coincidence? Ben has got to be thrilled. I’m thrilled for him. He so talented. I can’t wait to read Beth Ferry’s book. It looks adorable. I’ve congratulated Ben but haven’t chatted with him about this. It sure would be fun to have a chat. He’s being interviewed by my fellow EMUs at EMU’s Debuts this week so it will be nice to hear what he has to say. Oh, and I’m so glad you mentioned the EMUs! For those who aren’t familiar with this flock, it’s a group of debut authors represented by the Erin MUrphy Literary Agency (hence the EMU name). I encourage other debut authors to follow this blog’s excellent example of grouping together for support, promotion and fun! Thank you, Penny, for sharing your debut experience and best wishes with your OLD DRAGON! Also, thank you for sharing a SIGNED COPY with our blog readers! Comment below to be entered to win THERE WAS AN OLD DRAGON WHO SWALLOWED A KNIGHT. SHARE this post online and leave another comment with those details. Each SHARE counts as an entry! A winner will be randomly selected in two weeks.